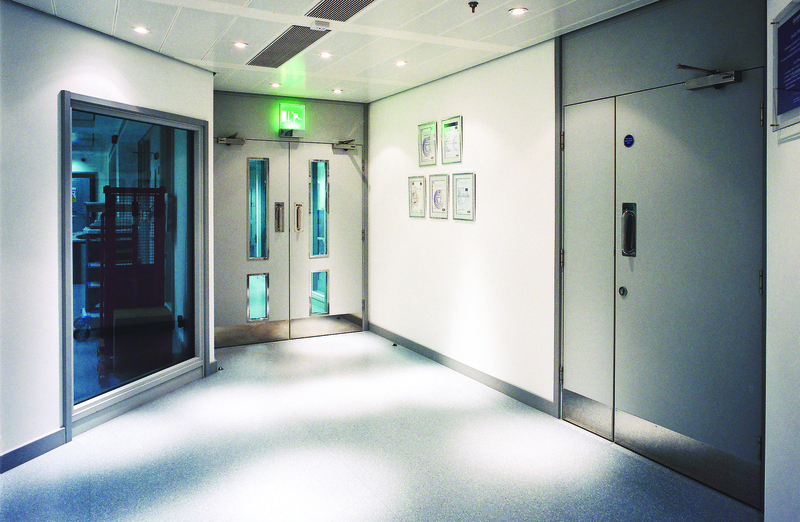 A Hospital Fire Door is a critical safety feature of a healthcare building, providing a barrier to prevent or delay the spread of fire and smoke, while maximising the time available for egress, to allow occupants to evacuate to a place of safety. In the case of healthcare facilities, protecting escape routes for as long as possible can be vital where the mobility of building users, which includes the infirm and elderly, may be limited. Healthcare environments are particularly tough on doors. With traffic flowing through them 24 hours a day, damage is inevitable, from porters’ trolleys, beds, wheelchairs, staff and patients. Cracks, dents and tears in doors can not only reduce their effectiveness in a fire but can also harbour dirt and bacteria, compromising hygiene. As patient safety is of paramount importance, a damaged hospital fire door and its frame has to be repaired or replaced as soon as possible. The Regulatory Reform (Fire Safety) Order 2005 (RRFSO), which came into effect in 2006, saw the transfer of responsibility for fire safety to building owners and managers. Under the terms of the Order, every building must have a Responsible Person, who is required to carry out an assessment of the risks from fire, and then take steps to reduce or remove that risk. Under the RRFSO, the duties of the Responsible Person include regular inspections of fire prevention “assets”, including fire doors. BS 8214: 2008 recommends that door leaves and frames are checked at six-monthly intervals for superficial damage, structural damage and excessive bowing or deformation. and an annual check for office doors, plant rooms and other quieter areas. Regular checks should be made on gaps between door leaves and frames and between meeting edges to double doors. Gaps should be maintained and should not exceed 4 mm – any change in gap size could be as a result of wear or damage to hinges or pivots and could be an indication that fasteners are loosening or damaged. The ability of a hospital fire door to perform in a fire is dependent upon the condition and performance of the door seals. There are three types of seal for fire and cold smoke containment: intumescent seals designed to maintain the integrity of the doorset; smoke seals to restrict the flow of cold smoke before intumescent seals become effective and combined intumescent and smoke seals. If seals are damaged, deteriorated or are not making adequate contact with adjacent components, they should be replaced. When doors are replaced it is also good practice to replace all the seals at the same time. Seals should be replaced as continuous lengths, as joints are a further source of potential leaks in fires, and must be of the same formulation, dimensions and configuration as in the door manufacturer’s fire test report. Clearly it is essential to select a hospital fire door that not only provides a sufficient level of fire protection but that is also robust enough to reduce costly and disruptive repair or replacement. As doors are part of the building fabric, ease of cleaning is also important, to help infection prevention and control. It is a legal requirement for fire door manufacturers to provide proof of the ability of their products to resist the passage and spread of fire by providing test evidence. However, it is also recommended that fire doors are certified by third party accreditation. There are a number of schemes, including BM TRADA Q-Mark, BWF Certifire and IFC Certification, all of which provide assurance that products have been independently tested and are consistently manufactured to a high standard. When it comes to durability, specifying a high performance hospital fire door is a cost-effective approach, as they require less repair and replacement and can withstand intensive cleaning regimes. This can result in a lower whole life cost when compared to the cost of maintaining and replacing regular doorsets. An Acrovyn® 30 or 60 minute Hospital Fire Door helps to reduce maintenance costs and provide reliable fire protection, backed by fire test evidence and third party certification. The Acrovyn® cladding provides a long lasting finish, which is highly resistant to impact damage, easy to clean and maintain, making it an ideal solution for hygiene sensitive areas. Acrovyn® Doors are available in a wide range of colour and cladding options, and are the leading choice in long lasting and durable design.